A Warwickshire school devastated in a suspected arson attack is to receive a government cash award of more than £5m. Pupils at Avon Valley School in Newbold-on-Avon, Rugby, have been taught in mobile classrooms since it was badly damaged on 28 June 2004. Last year representatives travelled to Westminster to lobby for extra funds for rebuilding work as it was claimed an insurance settlement was not enough. The Department for Education and Skills said on Wednesday it is to give £5.5m. 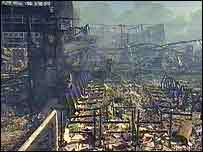 About three-quarters of the school buildings were destroyed and pupils' GCSE coursework was lost in the blaze. A 15-year-old boy arrested in connection with the fire was released on police bail in November last year. Since September 2004, the school has been using 30 temporary classrooms to teach about 1,000 students. School governors and county councillors met up with the then Schools Minister David Milliband in November to request money for repairs. They appealed for help from the government because they said an insurance settlement figure had not been enough to cover the costs of rebuilding and equipping the premises. Since then they have had several meetings with government officials and ministers to address the funding gap. Work is now due to start on drawing up designs for the new school. Eric Wood, from Warwickshire County Council, said: "There is still a funding shortfall, but this brilliant news from the government will enable us to build a state-of-the-art school that the community of Newbold can be proud of. "I can confirm that there will be a sprinkler system in the school and I am looking forward to the production of the design specification that can give everyone connected with the school something to focus on." Acting head teacher of Avon Valley School, Don O'Neill, said he was delighted. "On behalf of the governors and the school I would like to thank the officers at Warwickshire County Council for their hard work in achieving this," he said. "We will all be looking forward to the next phase with excitement."